The Tin Whisker got to show off its coolest new toy at coffee today. 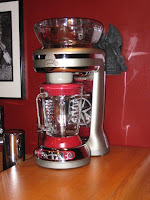 A Margaritaville Frozen Concoction Maker. It was a gift from Nancy's daughter Caroline. This officially makes her the "BEST GUEST EVER by proxy" of the Barnhart Barista & Group Therapy!